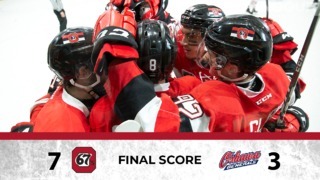 The Ottawa 67’s will be hitting the ice for yet another exciting weekend of hockey at The Arena at TD Place. In this three in three sequence, the Barber Poles will be traveling to Oshawa on Friday, before coming back to Ottawa in order to face the Generals for the second time in less than 24 hours. The Saturday game will be a Sportsnet Showcase game, with the puck drop scheduled for 3:30 PM. Andre Tourigny’s squad will round out the weekend on Sunday, when they will be hosting a Western Conference powerhouse, the Saginaw Spirit. Fresh off a perfect weekend at home, the Barber Poles will be coming into this stretch on a current two-game winning streak. In those last two games, Ottawa has scored 9 goals, while allowing only 3 goals. Mikey DiPietro shut the door against the Peterborough Petes last Friday, making him the record holder for most career shutouts for an OHL goaltender with his 17th. 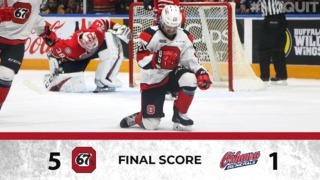 Offensively, the 67’s are staying red hot just like they have been all year. Tye Felhaber will be looking to reach the 50-goal mark over the weekend, which is very likely as Ottawa’s number 29 is now at 48 goals in just 45 games. Since coming back from injury, his line mate Marco Rossi is also on a hot streak, collecting 11 points in 7 games. Rossi played a crucial part in his teams’ last win, netting two goals against the Bulldogs. Still in first place in the OHL overall standings, it will be interesting to see how Ottawa measures up against one of the better teams in its’ own conference and definitely a potential playoff opponent in the near future, the Oshawa Generals. Ottawa will also have its’ hands full with the task of defeating the Saginaw Spirit, who have had a scary lineup since the trade deadline. Currently on a five-game winning streak, the Generals are definitely feeling good about themselves and will be looking to come out very strong in both of these matchups. Oshawa have played really well all season against the 67’s and now look like they’re coming into their own, as they are third right now in the OHL’s Eastern Conference. 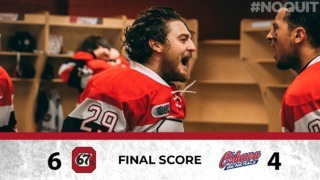 Adding some key pieces during the trade period like Brandon Saigeon, who leads the Generals in points with 69 in 45 games, as well as Anthony Salinitri, who has 59 points, Oshawa now has a very deep offensive team, who already counted on NHL draft picks Serron Noel and Allan McShane. In goal, Oshawa counts on a very good goaltender in Kyle Keyser, who has a record of 20-5-1 this year, with two shutouts to his name. Playing against Ottawa on Friday night, fans will be able to catch the rematch the very next day from all over the country, as the game will be broadcast from Sportsnet as soon as 3:30 PM. Another team who has been very hot as of late, the Saginaw Spirit has won their last three games and nine out of their last ten matchups. Saginaw acquired two very big pieces during the trade period: Team Canada forward Owen Tippett and ex-Mississauga Steelhead Ryan McLeod. All in all, the Spirit counts seven players on their roster who were drafted by an NHL team. Cole Coskey is the leader in points for Saginaw, with 53 points in 40 games. A player to watch is offensive defenseman Bode Wilde, who from the blue line has put up 46 points this year. For his part, Owen Tippett has put up five points in his last three games. When Ottawa traveled to Saginaw back in early November, the Barber Poles had dominated, winning the game 8-2. Seven different players from Ottawa found the back of the net that night. 67’s forward Tye Felhaber still leads the OHL with 79 points in 45 games. He also leads the league in goals with 48. More than likely to see action over the week end, goaltender Cedrick Andree leads the OHL in wins with 26. Another 67’s player to lead the league is Austen Keating, who is the assists leader with 48 this season. It should be a duel of goaltenders this week end between Kyle Keyser and Mikey DiPietro. Keyser leads the OHL in GAA with a 2.39 average, while DiPietro is second with a 2.43 GAA. Even though he has only played 30 games, Marco Rossi is the second-leading rookie in points with 38.